Quilty Habit: Herringbone Wedding Top Finished! This past weekend was the bridal shower for one of my oldest friends, Julie. We met in high school (we clicked at a friend's birthday party and quickly became inseparable), and we both attended the same college. She's two years older than me, and we have both been there through each other through everything! She was a maid of honor at my wedding and I'm a bridesmaid in hers. Basically, no matter what, as long as she and her fiance Brian were game, I wanted to make them a quilt for their bed as a wedding gift. "In the process" picture taken at a recent sewing day with some quilty friends. 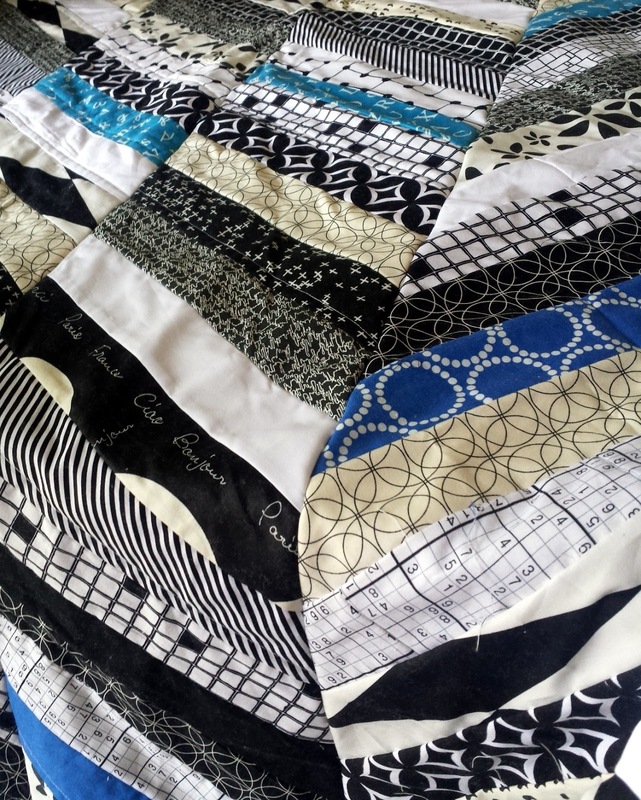 This quilt is bigger than it looks - it's queen sized with a large drape! I sewed the top together using quilt-as-you-go and a modified version of Maureen Cracknell's Herringbone quilt. 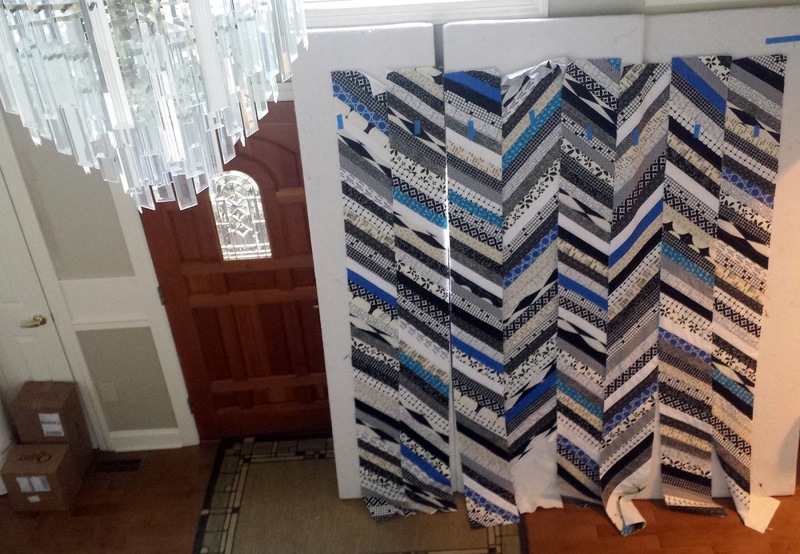 I'll talk more about the design process when the quilt is finished, but I just really wanted to share these photos! The wedding is in October, so I probably won't have the whole quilt done until the end of the year (realistically November, if nothing else distracts me). There won't be much quilting involved with this one but piecing the backing will take a while! 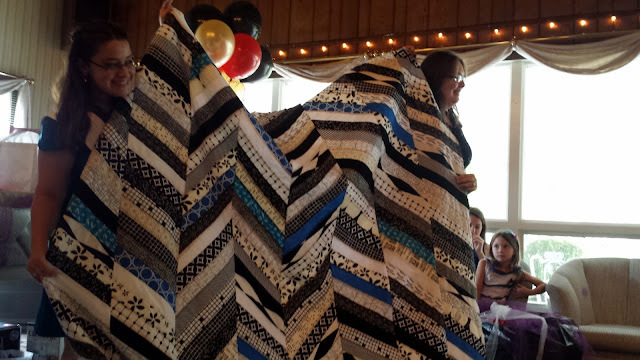 One of Brian's relatives also gifted the couple a lap quilt; it was started by his grandmother who has since passed away, and it was then finished for the couple. It looked hand pieced and it was just lovely. The sentiment of quilt giving was everywhere! I don't think I'll ever go to another shower without gifting a quilt (as long as I can manage it :) ). It was a beautiful shower, and I hope Julie is feeling the love! I love that it will be reversible! 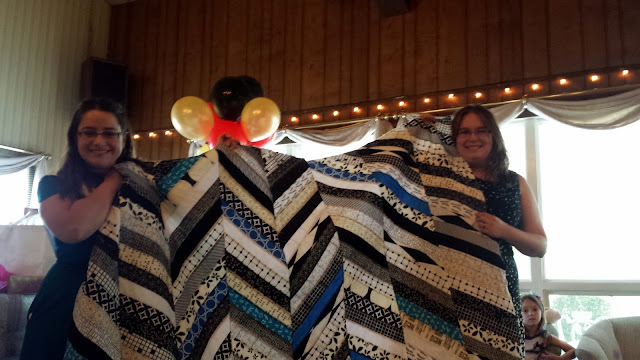 That is one huge quilt and one lucky friend. Such a generous gift! She looks so happy! Beautiful! I can't wait to see the other side! They are going to love it! Such a beautiful, heart-felt gift! I can't wait to see what you do for the other side! It's going to be awesome! This is amazing!! There’s nothing better than a handmade gift. I am waiting for the complete project photos. I would like to make such a beautiful gift for my cousin who is getting engaged at the destination Los Angeles event venues. Thanks for this idea!